An Eye For Order specialize in Residential Organizing, Relocation & Moves, and Closet Makeovers. We assist you with customized organizing solutions to meet your everyday needs. 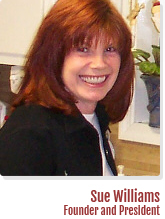 Raised in Atlanta, President and Founder, Sue Williams, has always been passionate about organizing. Sue draws her skills from her own experience and after a successful 20 year career in the corporate world of Human Resources at BellSouth Corporation, Sue found her passion and founded her business, An Eye For Order. For years Sue has made her surroundings – as well as those of her friends, family and clients – orderly, beautiful and comfortable. She delights in the opportunity to bring balance into the home by creating harmony. As an active member of both the National and Atlanta Chapter of NAPO, the National Association of Professional Organizers, Sue stays current with the latest techniques, products and exchange of ideas. She serves as the Chapter Librarian and works on other sub-committees within the Chapter. Most recently, She was featured in an article published by the Marietta Daily Journal (see Press) expressing her closet organizing expertise. Allow Sue and her staff at An Eye For Order help simplify and create order in your everyday life. So you have everything in order and don't need help getting organized. But we all know people who do! Whether it's a friend, family-member or co-worker, time with a Professional Organizer is a unique, practical and useful gift.